Winter Storm Selene clobbered areas from Denver to southeastern Wyoming Wednesday morning, dumping more than two feet of snowfall at a very rapid rate. In Colorado, the state's National Guard resources were deployed to assist in rescue missions as every major highway leading out of Denver was closed, making travel nearly impossible Wednesday afternoon. About 1,000 flights were canceled Wednesday at Denver International Airport before officials decided to close the airport indefinitely due to the severe wintry conditions. The airport announced Pena Boulevard was impassable, giving travelers no way to get to their flights. The outbound lanes of Pena were later cleared, and the airport reopened at 7 p.m.
Up to 16 inches of snow was recorded in California as the system made its way across the West Coast. In parts of Wyoming and Colorado, more than a foot of snow have already fallen, and more is on the way. As a result, schools have been closed and the heavy, wet snow is leading to widespread power outages. Here's the latest from this winter storm. A major travel problem unfolded Wednesday when relentless snowfall covered roadways, and gusty winds brought visibilities down to dangerous levels. Officials were forced to close Interstates 25, 70 and 76 in all directions out of Denver when the snow became too heavy for the nearly 500 plows to keep up. "There are many accidents," Colorado State Police Trooper Nate Reid told the Denver Post. "I would never be able to give you a number." A "very large number of patients" have been admitted into the University of Colorado Hospital's emergency department as a result of snow-related car accidents, said hospital spokesperson Dan Weaver. "That's been the main cause of patient transports to the hospital today." Northeast of Colorado Springs, multiple drivers were stranded in the town of Falcon, according to the city's fire department. Colorado's National Guard resources were activated on rescue missions caused by the onslaught of snow, according to the State Emergency Operations Center. The Guard deployed teams to support stranded motorists on Highway 83 near Monument, on I-70 near Bennet, and on I-76 near Fort Morgan. Over the course of the day, nearly 200,000 customers lost power, Xcel Energy said, but as of late Wednesday night power had been restored to 83 percent of impacted customers. At Denver International Airport, where hundreds of flights into and out of the city were canceled, a power outage was largely to blame for the early-morning headaches. Xcel Energy was able to restore power at the airport a few hours into the outage, but cancellations skyrocketed. The airport also lost the ability to pump aircraft and deicing fuel during the outage Wednesday morning, local radio host Steffan Tubbs reported via Twitter. Denver Public Schools were closed Wednesday as Selene hit eastern Colorado hard with big snowfall rates. In addition to DPS, several other school districts were also closed Wednesday. The Denver Post has a complete list. A list of emergency operation centers and shelters in the Greater Denver area can be found here. 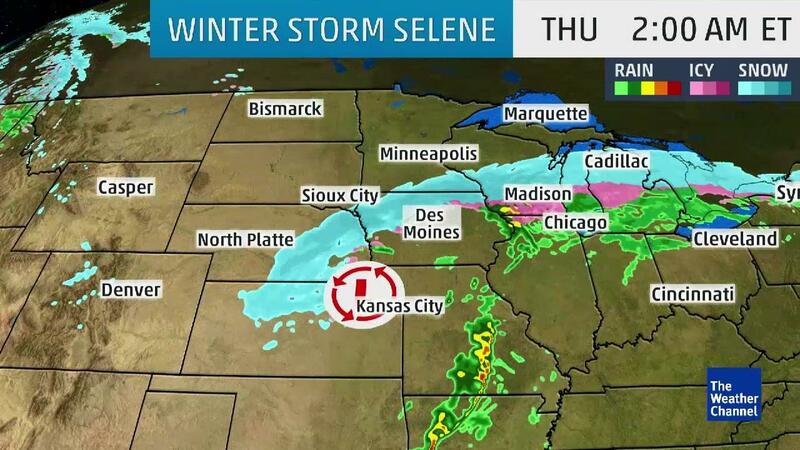 Selene forced a closure of Interstate 80 Wednesday morning that spanned more than 300 miles from Rock Springs to the Nebraska state line, according to the Associated Press. I-25 from Douglas to the Colorado state line was also closed Wednesday morning -- a stretch of 140 miles. The National Weather Service reported whiteout conditions Wednesday morning in Cheyenne. "It's pretty much kicking our hineys," Tim McGary of the Wyoming Department of Transportation told the AP. "It's bad enough we can't keep up with it. That's why everything is closed." The storm also affected campaign stops in the presidential race. Sen. Bernie Sanders canceled appearances in Laramie and Casper on Wednesday, the AP also reported, and former President Bill Clinton canceled a visit to Cheyenne on behalf of his wife, former Secretary of State Hillary Clinton. Governor Scott Walker declared a state of emergency as Winter Storm Selene moved into the Badger State, according to SW News. This storm "may cause dangerous drifting and blowing snow as well as limited visibility on roads and highways, causing treacherous driving conditions," Walker announced. "As a precautionary measure, we want to ensure all state resources are available and ready, if needed. We urge all Wisconsinites to be cautious of the weather conditions and remain safe while outside or driving." Walker called upon members of the Wisconsin National Guard to active duty to help authorities as needed, according to the AP. Schools in Outagamie, Winnebago, Waupaca and Calumet counties have already seen delays and closures, according to Post Crescent. A full list can be found on their website. Several highways in Nebraska have been closed by Selene, including a stretch of more than 100 miles of I-80 from Brule to the Wyoming state line. Many trucks have opted to stop traveling through the state and wait out the winter storm, Becky Buda, a clerk at the Sapp Bros. Travel Center off I-80 in Sidney, told the AP. A snow alert has been declared for the city of North Platte, 1011Now.com reported. Some schools were closed Wednesday as the state prepared for Winter Storm Selene, while others delayed opening, the AP reported. In Rapid City, additional snow-removal crews were brought in overnight Wednesday to battle the storm, and Ellsworth Air Force Base permitted non-essential personnel to report late, the AP also said. Authorities advised residents to stay off roads unless travel was necessary in south-central Minnesota Wednesday afternoon, the AP reported. The storm was expected to arrive in the state at that time, and heavy snow and high winds would make travel very dangerous. Over 100 flights both departing and arriving into Minneapolis -- Saint Paul International Airport have been canceled, according to FlightAware. Another 100 have been delayed by the harsh weather. Numerous schools in the Greater Minneapolis area have canceled afternoon and evening activities due to the wintry weather, according to CBS Minnesota. A full list of closures can be found on their website. Light snow turned heavy in Salt Lake City Tuesday morning, right around the time of the morning commute. Several minor accidents and slide-offs occurred around the Salt Lake Valley, FOX 13 Salt Lake City reported. An intrasquad game between the Los Angeles Angels and their Triple-A affiliate, the Salt Lake Bees, was canceled after snow blanketed the city. ICYMI – Today's Bees vs. @angels game has been cancelled due to snow. The Utah Department of Transportation activated snow plows in order to clear roads of the spring snowfall. "Already, I think, some of us have our sights set on spring and summer. But, we need to remember to slow down," said UDOT spokesman John Gleason. In areas of the Sierra Nevada, strong winds and snowfall made driving conditions difficult, causing a rollover accident west of Kingvale on I-80, according to ABC 10. Caltrans, the California Department of Transportation, urged drivers to be alert during the wet and snowy conditions in the Sierra. "Two things, slow down and be alert," David Wood, a spokesperson for Caltrans, told FOX 40. "Don't let anything distract you. It takes a lot longer to stop on snow, and you never know what's around the corner." During the storm, an NWS storm report clocked a 113-mph wind gust at the White Mountain Summit Research Station.